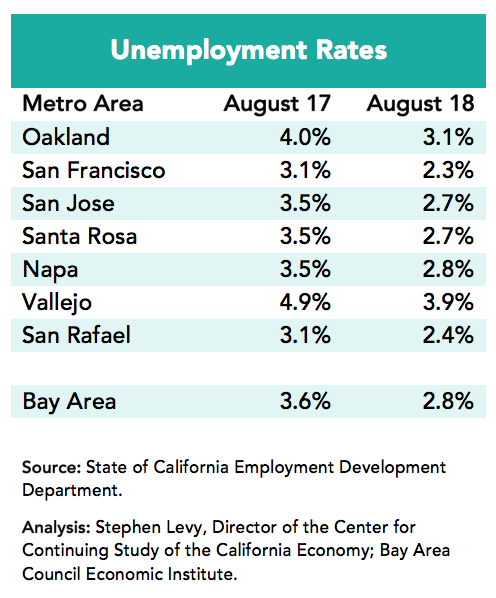 Bay Area job growth accelerated in July and August and unemployment levels and rates fell sharply compared to a year earlier. More good news came in rising residential building permits and strong GDP growth, which is displayed in a separate memo. But very low unemployment rates and slowing population and labor force growth raise questions as to where the workers will be found to fill the planned expansions in the region. 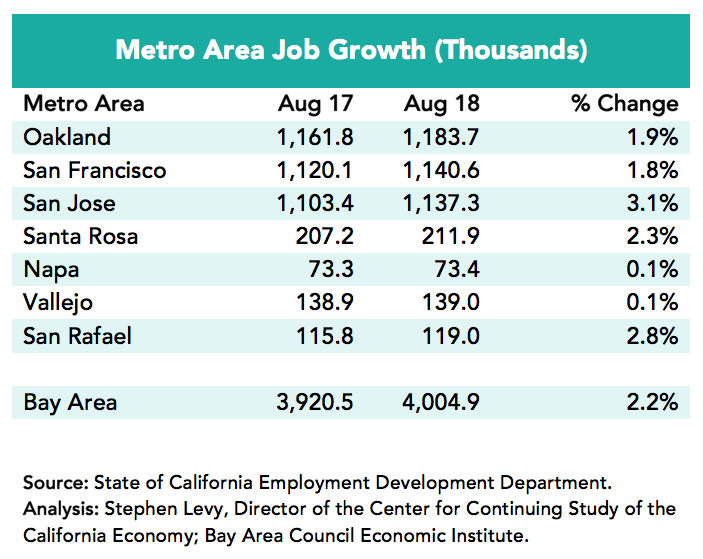 Strong job growth in July and August pushed year over year Bay Area job growth to +2.2% compared to 1.6% for the nation and 2.1% for California. The San Jose metro area led the region in job growth over the past 12 months with a 3.1% increase. Unemployment rates are sharply lower in August 2018 compared to a year throughout the region. The number of unemployed residents fell by 34,300 between August 2017 and 2018 and the regional unemployment rate of 2.8% is the lowest since the height of the dot.com boom. Labor force growth remained very low (+0.1%) during the past year..
Year over year job growth has been remarkably stable at near 80,000 over the past year and a half. Slowing labor force growth from boomer retirements will probably push job growth levels lower over the coming years. And last week brought more good news on housing. Cupertino and Sand Hill (the developer) will now choose between proposals that will bring 2,500 or near 3,000 new housing units on the Vallco site. And each day last week brought a new housing proposal for downtown San Jose. These proposals also bring units reserved for low-income families. This good news is important as companies continue to plan major expansions in the region. These expansion plans come at a time when the region is struggling to deal with the challenges of housing shortages and lack of affordability and increasing traffic delay. For the company expansion plans to become real will require housing for more workers on top of building for the existing shortages and increased mobility options to get workers to their jobs. While permit levels are now keeping pace with current population growth, this housing upturn does not come close to addressing the large shortage built up much less fully keep pace with current growth. And not all permits eventually get built. The next needed steps involve lowering the cost of building new housing, changing zoning to allow more and less expensive housing to be built and, hopefully, state funding to offset some costs of housing. Perhaps the hardest challenge to overcome is the lack of affordable housing for middle income residents who are not eligible for subsidized housing even if it were available in sufficient quantity. 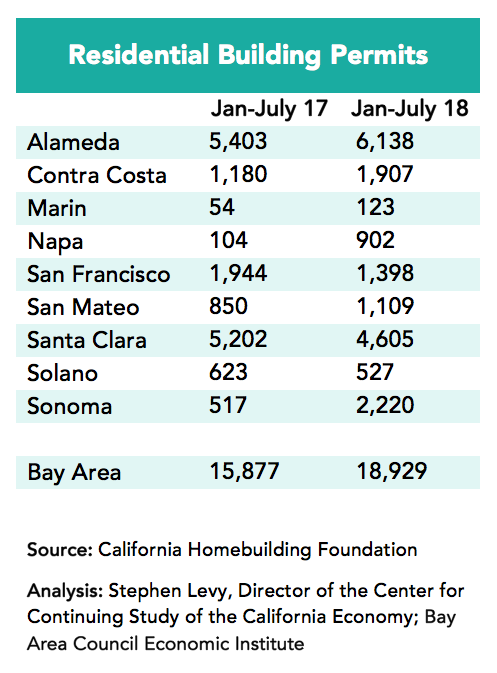 The bottom line, which should be understandable to Bay Area Council members, is that it is really hard if not impossible under current rules to build housing that is affordable to middle income residents yet pencils out for developers.